In many countries, women and families cook meals over open fires. This is one of the world’s most pressing health and environmental problems, directly impacting close to half the world’s population. Unsafe cooking causes 2.6 million premature deaths each year – toxic smoke and fumes from cooking over open fires lead to health concerns like pneumonia, lung cancer, and heart disease – all of which can be prevented by switching to safer cookstoves. Moms and their children are disproportionally affected by this massive global challenge, suffering from not only inhaling toxic smoke, but also the burden that comes with gathering firewood for cooking. By developing a thriving global market for clean and efficient cookstoves, we can transform the way the world cooks, save lives, improve livelihoods, empower women, and protect the environment. Clean cooking helps drive women’s empowerment. 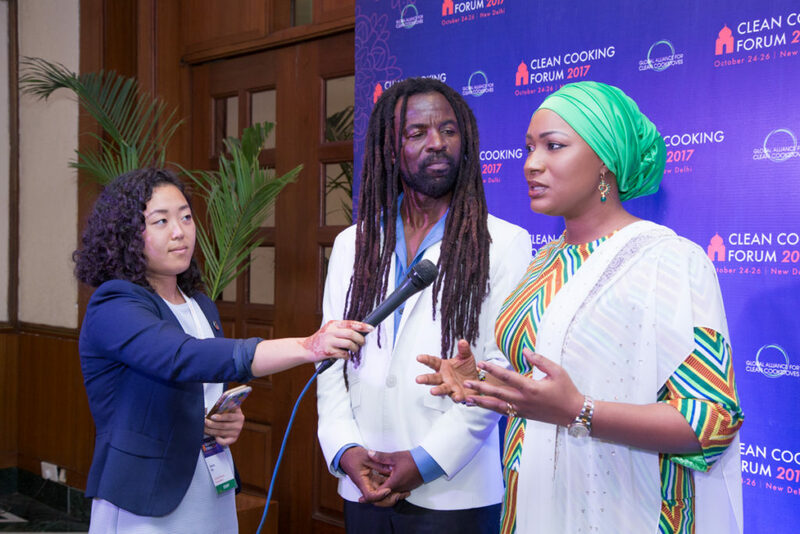 From October 24-26, the Clean Cooking Forum 2017 took place in New Delhi and gathered hundreds of global leaders from around the world working to accelerate access to cleaner, more efficient cooking solutions. A key takeaway that especially resonated with me was the idea that clean cooking is a solution to multiple problems – health concerns, climate change, and women’s empowerment. By investing in clean cooking, we can help achieve the global goals and make progress for moms and families. As the Second Lady of Ghana, Samira Bawumia, pointed out, the concept of clean cooking can be equated to “the great awakening.” Ms. Bawumia has already done incredible work in the space of health, environment, and development to improve lives in Ghana, but she notes that no one had really connected the dots between clean cooking and health. “The thing about maternal mortality is – if you successfully save these women’s lives but send them back to hazardous kitchens and back to environments that harmful for her and her child, you’re really back to square one,” she said. Now that she is a Global Alliance for Clean Cookstoves Ambassador, she says it is important for her to push out this agenda and create a shining example in Ghana. Radha Muthiah, CEO of the Global Alliance for Clean Cookstoves, emphasized this: to tackle big problems like poverty and poor health, it is necessary to invest in clean cooking. Cooking shouldn’t kill. #GlobalMoms, help raise awareness of the numerous, high impact issues that clean cooking addresses by sharing this post or writing about clean cooking on your blog. Drop us a note for resources to get started. Follow the Global Alliance for Clean Cookstoves on Facebook, Instagram, and Twitter to keep up with the latest news, events, and initiatives in the clean cooking sector. Donate to the Global Alliance for Clean Cookstoves, which provides grants for research, capacity building, training, entrepreneur support, in-country alliances and other initiatives that help advance and catalyze the clean cookstoves and fuels sector. Gloria Roh joined the UN Foundation in March 2017 as a Communications Associate. In this role, she works with international journalists and aims to increase and enhance the quality of reporting on global issues and the Sustainable Development Goals. She is often described as calm, cool, and collected.